Archbishop Diarmuid Martin will led the Way of the Cross through the Phoenix Park on Good Friday 19 April 2019. The procession will proceed from Wellington Monument at 12.00pm to the Papal Cross in the Phoenix Park. Prayer around the Cross ( Taize) will take place at 9.00pm on Good Friday in Dalkey Parish, following the Stations of the Cross at 7.30pm. Family stations of the Cross will take place at 12.00 noon and a solemn celebration of Our Lord’s passion and Holy Communion at 3.00pm. Sonrise Ecumenical Service will also take place on Easter Sunday morning on Killiney Hill beside the Obelisk at 6.15am as we celebrate the resurrection of Christ. Everyone is most welcome to this very special celebration. Good Friday night at 8 pm we have our Stations of the Cross done with real people acting out the stations and beautiful thought provoking meditations being read. An Invitation to all to our Ecumenical Son-rise celebration in prayer, word and music to celebrate Easter Day 21st April. Easter Sunday Morning 5.45am at Montpelier Hill (Hellfire Club). 12.00 noon Stations of the Cross With St. Mary’s Pro-Cathedral Girls’ Choir. 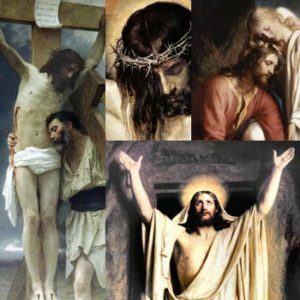 3.00 p.m. Celebration of the Lord’s Passion Principal Celebrant – Archbishop Diarmuid Martin, D.D. The Passion according to St John – Victo ria , Improperia – Victo ria, Miserere Mei – Alle gri, O Vos Omnes – Casals, Soul of My Saviour – The Palestrina Choir. Confessions From 10.00 to 11.00 a.m.
From 1.00 to 2.00 p.m. From 4.30 to 5.30 p.m.
Confessions – From 11.00 a.m. until 2.00 p.m.
Church opens at 10.00 a.m.—closes at 2.30 p.m. & re-opens at 7.45 p.m. Principal Celebrant – Archbishop Diarmuid Martin, D.D. Easter Monday 22nd April – Mass at 10.30 a.m. Please Note : Mass each day at 10.30 a.m.
No confessions. Church opens at 9.00 a.m. and closes at 3.00 p.m.
Holy Thursday, 18th April, Morning Prayer 9.10 a.m.
8.00 p.m. Mass of the Lord’s Supper. Adoration at the Altar of Repose to 10 p.m.
Good Friday, 19th April, Morning Prayer 9.10 a.m.
Holy Saturday, 20th April, Morning Prayer at 9.10 a.m.
9.30 a.m. Irish /As Gaeilge, 11.00 a.m., 12.30 p.m.
Easter Monday to Saturday, Morning Prayer at 9.10 a.m.
Monday 15th April Marley Grange 8.00 p.m.
Tuesday 16th April Meadowbrook 7.30 p.m.
Holy Saturday 20th April Dundrum 12.00 noon. Mass of the Lord’s Supper with Washing of Feet, church open until 10.00pm for Adoration, Sts Alphonsus and Columba, Ballybrack. 9.00pm: Easter Vigil, Sts Alphonsus and Columba. Easter Sunday Masses in Sts Alphonsus and Columba (10.00am); Church of Apostles (12.00pm). Easter Week Masses in Ballybrack (10.00am): Monday & Wednesday: Sts. Alphonsus & Columba; Thursday: Church of the Apostles; Friday: Sts. Alphonsus & Columba. Stopping at Holy Spirit Church and finishing in Virgin Mary Church. 9.00pm: Solemn Easter Vigil and Mass of the Resurrection. The Church will open at 8.00pm on Holy Saturday for the Easter Vigil. There will be no usual 6.30pm Mass. The Combined Catholic Parishes of Clondalkin invite you to join with us at our Dawn Mass, Easter Sunday Morning (21 April) at 6.00am in Corkagh Park, Clondalkin, Dublin 22. All Welcome. 3.00pm Solemn Celebration of the Lord’s Passion. This Sunday is Palm Sunday. Blessed Palms will be distributed at the 6.00pm vigil Mass on Saturday and at the 12.00 noon Mass on Sunday. Starting at 6:15pm returning to Halston Street by 7.00pm concluding with Veneration of the Cross and Holy Communion. You are invited to join the Ecumenical Taizé Walk from Christchurch Cathedral to the Pro Cathedral which takes place immediately after the parish outdoor stations. Taizé Prayer around the cross and Sacrament of Reconciliation follow in the Pro Cathedral until after 9.00pm. Morning Mass Monday, Tuesday and Wednesday at 10.00am. 7.30pm Solemn Mass of the Lord’s Supper – followed by watch and pray Vigil. 3.00pm Solemn Liturgy of the Lord’s Passion with Veneration of the Cross and Holy Communion. Quiet Time finishing at 8.45pm. Tuesday 23rd – Friday 26th April 10.00am mass only. Confessions are also available on request. Holy Thursday, 18th April, 7.30pm Mass of the Lord’s Supper with Washing of Feet, church open until 10pm for Adoration, St. Columbanus. Good Friday, 19th April *time to be fixed: Outdoor Stations of the Cross; 3.00pm: Commemoration of the Passion, St Columbanus. Holy Saturday, 20th April, 9.00pm Easter Vigil, St. Columbanus. Easter Sunday, 21st April, 11.00am Easter Mass in St. Columbanus. Easter Week Masses in Loughlinstown, 9.30am: Tuesday and Wednesday. 7.30 pm Solemn Celebration of the Lord’s Supper – music led by the Folk Group. Prayer at Altar of Repose until 10.00pm. 12.00 noon – Children’s Stations of the Cross organised by the Family Mass Group. 3.00pm Solemn Celebration of the St Mary’s Passion of Our Lord – music led by St Mary’s Parish Choir. 6.00pm Youth Meditation — In the Church of St Mary, especially aimed at teenagers and young adults. You might like to join us for 30-45 minutes in this guided prayer. Afterwards, come along for light refreshments in the Pastoral Centre. 7.30pm Adult Stations of the Cross Music led by the Folk Group. After the Stations, Prayer around the Cross will continue for half an hour. 10.30am Confessions will take place immediately after the 10.00am Morning Prayer. 10.45am Blessing of the Food Baskets. 6.14 a.m. As the sun rises we celebrate the rising of the Son of God from the tomb. This year we will meet at The Harbour, Maynooth at 6.00am to await in prayer the rising of the sun. Please note: This is a Prayer Service not Mass and car parking is available adjacent to Reilly’s Funeral Home. After the Prayer Service you are welcome for a cup of tea and some refreshments in the Scouts Den in the Geraldine Hall. One daily Mass in St Mary’s Church at 10.00am. 8.00am & 10.00am Masses resume on Tuesday 5th May. Sunday, 28th April You are invited to join in celebrating Divine Mercy Sunday at 3.00 p.m. (Divine Mercy hour) in St Mary’s Church. Beginning with the blessing of the Divine Mercy image, praying the Divine Mercy Chaplet and Mass. Veneration of image after Mass. 7:30pm Celebration of the Lord’s Supper: St Sylvester’s Church – Adoration until 10:00pm. 8:00pm Celebration of the Lord’s Supper: Convent – Adoration until 10:00pm. 10:00am Morning Prayers: St Sylvester’s Church. 10:00am Morning Prayers: St Sylvester’s Church 10.30am — 12.00 noon Confessions. 9:00pm Easter Vigil: St Sylvester’s Church. 9:00pm Easter Vigil: Convent. 7.30 p.m. Mass of the Lord’s Supper. Adoration and Prayer until 10 p.m.
Easter Sunday, 21st April Masses 10.00 a.m., 11.30 a.m.
Mass at 10.00am and 11.30am. Masses 9.00 am, 10.30 am, 12.00 Noon. Monday, Tuesday and Wednesday – Masses 9.15 am. and 10.00 am. Solemn Mass of the Lord’s Supper at 7.00 pm followed by Adoration of the Blessed Sacrament 9.00pm – 10.00pm Holy Hour (Silent Prayer). 12.00 noon – Stations of the Cross. 3.00pm Solemn Liturgy of the Lord’s Passion and Holy Communion. 7.00pm Taizé – reflection/meditation and music (Gospel Choir). Holy Saturday – No morning Mass. Easter Sunday – Masses: 9.30am, 10.45 am, 12.00 noon and 7.00 pm. Masses rest of week 10.00am only. Stations of the Cross at 12.00 noon. Confessions 10.30am to 12.00 noon. This is the Principal celebration of the Church Year and Fulfils the Obligation for Easter Sunday Mass. Masses at 10.30am (School Hall) and 12.00 noon. Evening Mass of the Lord’s Supper 6.30p.m.followed by Adoration until midnight in the Angel Chapel. Good Friday Morning Prayer 9.00am, Stations of the Cross for Young People 12.00 noon, Solemn Celebration of the Passion (Veneration of the Cross and Holy Communion) 3.00 pm, Stations of the Cross 7.00 pm. Holy Saturday Morning Prayer 9.00am Solemn Easter Vigil 9.00pm. Easter Sunrise interdenominational Service on Howth Summit – Assemble at 5.55am. led by Terenure College Community Choir. Holy Saturday Easter Vigil 9.00pm. Parish Choir Mass at 11.30am. Holy Saturday 10.30am to 11.15am and 5.30pm to 6.15pm. The Parish Office will be closed until Tuesday, 30th April, 2019. Adoration of the Blessed Sacrament 8.30-9.30pm. Solemn Ceremony of the Passion & Death of Our Lord Jesus Christ 3.00pm. Prayer around the Cross 6pm. Holy Thursday: 10.00am & 12.00 noon. Good Friday: 10.00am & 4.00pm. Holy Saturday: 10.00am & 12.00 noon.